BounceU started out of a love for kids, and truth be told, we’re all still young at heart! That’s why we created the funnest, most happiest private party place in the universe for kids. Apparently Parents Magazine agrees. 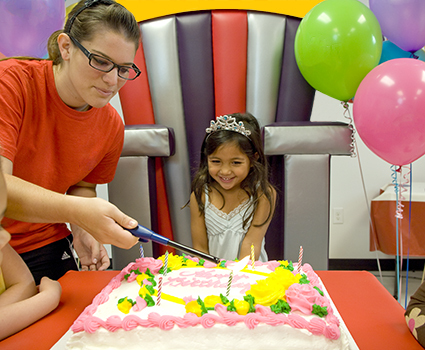 That's why they named BounceU one of the top 10 Best Birthday Party Places of 2014! 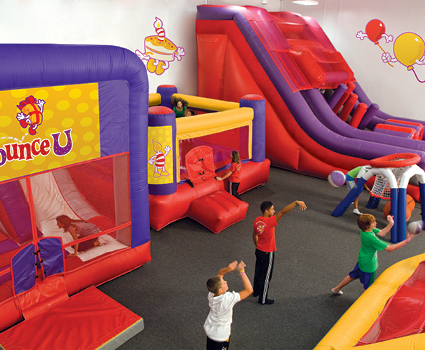 BounceU of Oceanside is part of the world's largest franchised network of indoor inflatable party and family recreation centers, but we are owned and operated by parents like you. We love to see families and friends just being themselves in a private-party environment, going a little wild, and sharing memories that will last a lifetime. We understand you're too busy to worry about planning and that you want your kids to feel like the center of attention. We know you'd like your inflatable parties to be unique, exhilarating, and stress-free. That's why we're one of the very best party places for kids! As parents, we know how important safety and cleanliness are to you. That's why we go to extraordinary lengths to ensure our facilities and programs are safe, upbeat, and truly memorable. We know our popularity is due to you. That's why after Superstorm Sandy, we rebuilt BounceU of Oceanside even better than ever. And that's why we have quietly donated over $50,000 in passes, merchandise and cash donations to such organizations as Make-A-Wish, local schools, churches and temples, youth groups and many other worthy groups. We are proud to serve the families of Oceanside, Rockville Centre, Long Beach, the 5 Towns, and rest of Long Isand, Far Rockaway, Brooklyn, Queens and everywhere else!